On Europe Dat, 9 May 2014, the finals of the MiLaS language competition took place in the impressive concert hall of the Alsion-building in Sønderborg / Sonderburg, Denmark. In the past weeks the language competition led to the creation of more than 30, for a part very diverse videos from 10 countries and in 25 languages, in the world-wide-web (take a look at: www.milas.language-diversity.eu). To decide who would be the winner was not easy at all. The top-notch international jury had a hard time and also the audience of more than 200 people from all over Europe clearly would have been satisfied if every single one of the finalists would have received a prize. But there can only be only one winner, or in the case of MiLaS, only two: the Ludwig Andresen School from the German minority in Denmark with their act “synnejysk kaffeboe” and Lisiana Demiraj from Albania with “Ai – He” shared the first place. Closely behind them was the second place for SAEK serbski widejokružk in cooperation with “Ignac Fecich & dance company” (DE) with the song “Ćek dom (Get home)”. The third place went to Manuel Trapp (DE) with his act “Stolz ein Jenischer zu sein (Proud to be Yenish)”, which he had to share with the Seventh Grade Class of Deutsche Schule Pattburg (DK), with the act “Lasse und Maria”. We would like to express our thanks to the concert hall of the Alsion-building for their professional structure and their great support. We also thank the Nordschleswigsche Musikvereinigung-orchestra and Simon Glöde and his band for their music performances during the prize ceremony. A special thank you for our two moderators Hester Knol and Stephan Kleinschmidt, who navigated us through the programme. We also thank the Region of Syddanmark for their financial support for both the prize award ceremony and also for the competition. Last but not least we want to very much thank all the participants, our European jury, all organisers and supporters and the great audience in the Alsion-building: It has been great fun together with you! 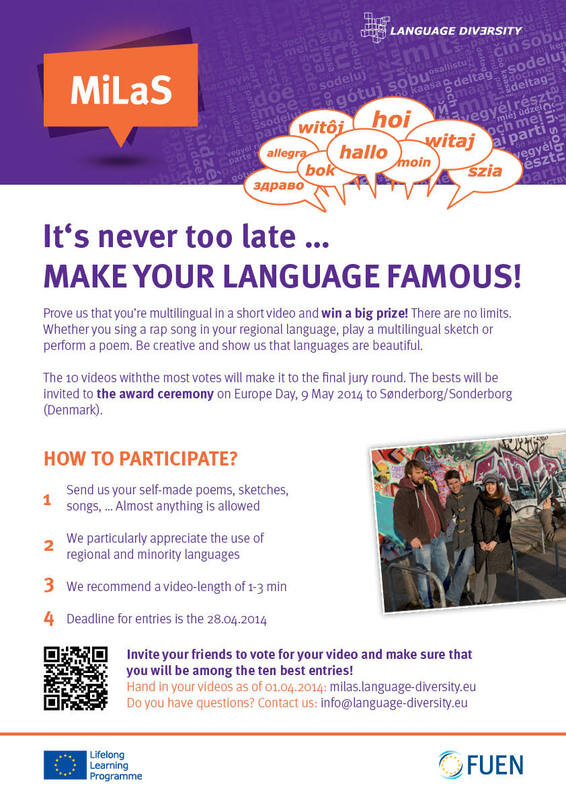 MiLaS – in April 2014 our European language campaign language diversity started the first Europe-wide online-language competition for youth and young adults, that focuses on linguistic diversity and multilingualism. The emphasis is put particularly on the regional and minority languages of Europe, which should become more attractive and improve their image. “Show us how beautiful your language(s) are! Show us in a relaxed, cool, funky or emotional way, using self-written poems, sketches or songs, what you are capable of and how beautiful your language(s) are!” – that was our call. It is never too late… make your language famous! 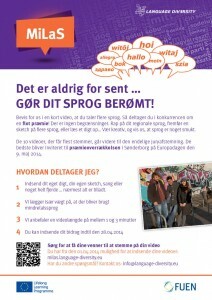 MiLaS – We invite you for the prize ceremony in Sønderborg – the best five videos will be chosen! MiLaS – what is it all about, many people will ask. Easy: in April our European language campaign “language diversity” organised the first Europe-wide online-language competition for youth and young adults, that focused on linguistic diversity and multilingualism. The emphasis is put particularly on the regional and minority languages of Europe, which should become more attractive and improve their image. “Show us how beautiful your language(s) are! Show us in a relaxed, cool, funky or emotional way, using self-written poems, sketches or songs, what you are capable of and present your language(s)” – that was we asked for. From a total number of 30 contributions from 10 countries and in more than 25 languages the 10 most popular videos were selected in the first round by Facebook-users at our social media platform milas.language-diversity.eu. In the second round our jury of six persons from all over Europe had to decide. Based on 8 criteria (e.g. artistic quality, creativity, originality, content, reach) the jury selected the 5 best videos out of the 10 most popular contributions. The five finalists will now be invited to the prize ceremony in Sønderborg (DK) next Friday and their videos will be presented to the audience in a third round. The winner will get 1000 Euro. The competition and prize ceremony are supported by the Region of South Denmark, from funds allocated to celebrate the jubilee of Dybbøl 2014. We invite you all for the MiLaS prize ceremony at Europe Day, 9 May 2014 at 17:00 hr in Sønderborg, which will take place in the concert hall of the Alsion building. It’s never too late… make your language famous! MiLaS – what is it all about, many people will ask. Easy: on 1 April our European language campaign “language diversity” will start the first Europe-wide online-language competition for youth and young adults, that will focus on linguistic diversity and multilingualism. The emphasis is put particularly on the regional and minority languages of Europe, which should become more attractive and improve their image. Show us how beautiful your language(s) are! Show us in a relaxed, cool, funky or emotional way, using self-written poems, sketches or songs, what you are capable of and present your language(s). Every participant can choose his or her own poetic style. All forms of modern literature and creative language are allowed: classic or modern lyrics and sound poetry, cabaret and comedy, or short stories. We prefer rhythmic performances that interact with the audience, however. There are no limits, except for the length of course. You can upload a video of up to 3 minutes on our Facebook page and with the support of your friends, who can vote for you, you can win one of our great prizes. From the 10 most popular videos, our jury composed of persons from all over Europe will select the five best contributions. The authors of these videos will receive an invitation for the award ceremony in Sønderborg, Denmark, on Europe Day, Friday 9 May 2014. Therefore – don’t wait too long, be creative and show us, what you’re capable of. Because you can only win and make your own language famous! More information about MiLaS (background, terms and conditions, posters and FAQ) can be found here on our website.